Editor's Note: Oklahoma Baptist University alums Charles and Betty Alexander, both 1956 graduates, are 2011 recipients of the OBU Alumni Association's Profile In Excellence Award. The award is given to a former student who has "demonstrated recognizable accomplishment in his or her profession, business, avocation, or life service in such a way as to bring pride and honor to the University." Each year, Profile In Excellence recipients are featured in OBU Magazine. It just seemed like the right thing to do -- for Charles Alexander to follow his sister to OBU, and for Betty Nabors and her family to relocate from Addington, Okla., to Shawnee when it was time for her to attend college. Betty's parents rented a two-story house across the street from the campus, and her parents rented out four upstairs bedrooms to eight OBU students. It only seemed right for Charles to try to convince his friend, Ken Roper, to not move into the house, but stay in the dorm. He crossed the street and knocked on the door. Betty answered. Some seemingly innocuous decisions affect the rest of a person's life. In this case, the decision affected the lives of countless others on two continents. A romance sparked among the young co-eds while they pursued their studies on Bison Hill. Charles had felt called to the pastoral ministry, and Betty had nurtured a talent in music through high school. Charles studied under several professors who made a big impression on the young man, including Dr. Forbes Yarbrough, Dr. James Timberlake, Dr. Opal Cole and Dr. Robert Laessig. 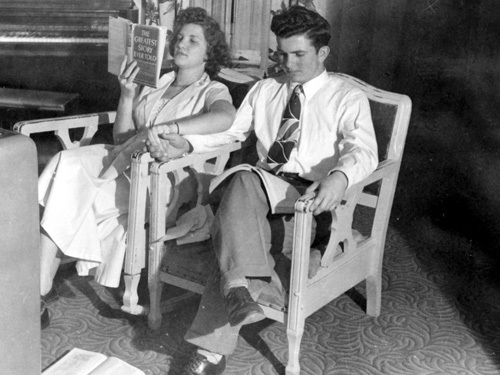 As OBU students in 1951, Charles and Betty Alexander study in the Nabors' Boarding House in Shawnee, where they met on the doorstep. "Dr. Timberlake was particularly significant in arranging an opportunity during my freshman year to go before a small church south of Ada, Connerville Baptist Church in Johnston-Marshall Association," Charles said. "This resulted in a four-year relationship in which I was thrown in, sink or swim, to pastoral responsibility and the weekly labor of sermon preparation and delivery. The precious people there took me, and later my bride, under their wings and nourished us both materially and spiritually." His bride was Betty, whom he married three years after their unexpected meeting. She recalled she was fascinated with the multi-talented Dr. Warren M. Angell and admired Uncle Jimmy Owens, but she found she also favored Dr. Yarbrough because she felt the need to be saturated in God's Word. She had dedicated her life to missions at age 12 after hearing Miss Lucy Smith from China give her testimony in Comanche, Okla.
"God's call to missions continued in my heart throughout our ministry in different church activities and as I attended Falls Creek Baptist Assembly every year and heard missionaries speak," Betty said. "It continued on through my college and seminary training and our pastorates as well." Betty worked so Charles could graduate from OBU on time in 1954. She managed to complete three years on her own studies, too. When the couple learned they were expecting their first child, they moved to Texas so Charles could pursue his seminary studies. Life seemed to change quickly in the ensuing five years. Charles worked as a clerk at the General Motors assembly plant and commuted back to Connerville on the weekends. Betty graduated from Texas Christian University and gave birth to their son, David. Charles accepted a role as a weekend pastor of Lebanon Baptist Church, also in Johnston-Marshall Association. Betty accepted a teaching position in Fort Worth, allowing Charles to focus on his seminary studies full time. Their daughter, Melanie, was born in 1960. Charles graduated from Southwestern Baptist Theological Seminary in 1963 and became the pastor of First Baptist Church in Washington, Okla.
"During our four years there, we enjoyed the experience of full-time dedication to ministry," Charles said. "The friendships developed there were phenomenal and still continue. It was during our final year in Washington that I felt the call that Betty had felt since her teen years, to foreign missions." The couple was appointed by the International Mission Board (then the Foreign Mission Board) in 1966. Following a year of language school in Costa Rica, the family settled in Chile, where Charles began his ministry as a chaplain and Bible teacher at "Colegio Bautisa," the Baptist Academy in Temuco. Betty worked as a kindergarten teacher at the academy and as a pianist wherever she was needed. On the set of "The Treehouse" in Cali, Colombia, cameraman John Magyar Jr. (right) and his dad, producer/cameraman John Magyar Sr., are set to film. 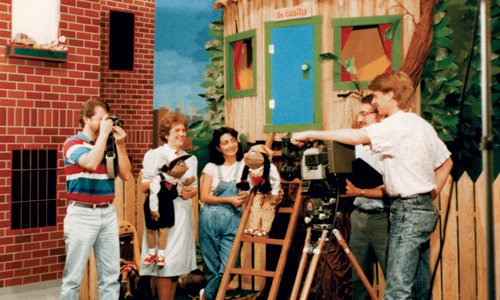 Missionary artist Brad Price (left) takes photographs while Betty Alexander and Patty Alexander pose with Pedro and Anita, two of the three puppet stars of the 26-program TV series. "The most difficult aspect was the language," Betty said. "In Costa Rica, where we studied Spanish for a year, the conversation was slow and easy going. (Warm climate!) When we got to southern Chile, the speech was so fast I didn't know what hit me! (Cooler climate!)" Meanwhile, the family grew: they all-but-literally adopted a young woman named Rosa Farfal, and her sister, Ida, who lost their parents in the 1960 earthquake and tidal wave in southern Chile. David graduated from OBU in 1979, Rosa in 1982, and Melanie in 1984. The Alexanders' missions service in Chile was disrupted by political upheaval, so the mission board assigned them to Lima, Peru, in 1973, to a literature ministry. Charles ran a wholesale book deposit offering Christian literature to bookstores throughout the country and supervised three Baptist bookstores in Lima, Trujillo and Arequipa. He also served as interim pastor of First Baptist Church of Lima for several months. Charles was known by fellow missionaries for his "unbelievable grasp" of the Spanish language. Whatever the task at hand, the Alexanders followed through with a cordial and willing spirit, including showing compassion to young people such as Patty Gloyd, who they adopted in Lima when she was 10 years old. The couple returned to Chile, where they worked for the remainder of their service -- 28 years in all. Charles was charged with the responsibility of Theological Education by Extension, and later as the district missionary of the South Association in Temuco. He was elected by the Chile Baptist Mission as administrator, so they returned to Santiago where he also served as interim pastor of Parque Apoquindo Baptist Church. Betty took an interest in puppetry with her to Chile, which caught the eye of a mission board administrator. He put her in touch with John Magyar in Baptist communications in Cali, Colombia, and the end result was 26 programs for television using homemade puppets. The program, in Spanish, was titled "La Casita en el Arbol" (The Treehouse). The project took three years and 13 trips to Colombia to complete. "When God is in something, He moves things along, and we had a fantastic team," Betty said. "He definitely led in every step of what we did. It is amazing what He does when He calls and one commits to what He wants done." The Alexanders retired from the mission board in 1994 and settled in Benbrook, Texas, where Charles serves as a deacon at First Baptist Church and is active in the church's audio/visual department. Betty continues her commitment to the puppet ministry, making and providing puppets and materials for churches needing programs, music, Bibles and other resources to help them reach children on missions trips. 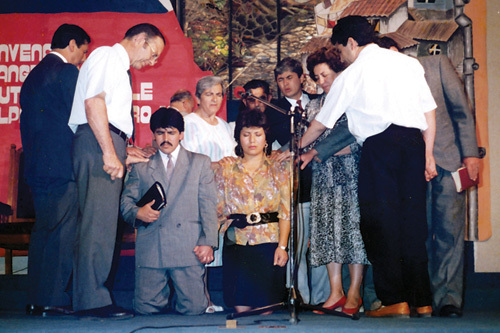 Southern Baptist missionary Charles Alexander (second from left) participates in the appointment service of Chilean Baptists' first foreign missionary family, who served in Ecuador. The appointment was a thrilling milestone for the convention. And true to the nature of their family -- which reflects the hospitality instilled by the Nabors' boarding house for OBU students years before -- the Alexanders have continued to unofficially adopt young people who they mentor in life: Victor Manterola from Santiago, Chile; Jorge and Sary Maldonado who live in Minnesota; and Marco Antonio Cuevas, a pianist from Temuco, Chile. Betty's mother, Tommie Nabors McGarr, a 1959 OBU graduate, lived with them until her death in January at age 99. "Ever since Charles and I married and David was born three years later, we have had someone living with us in our home," Betty said. "God has truly blessed us in this dedication to young people who are starting out in life and need guidance. We have truly received far more than we have given from these precious young people." Their compassion for people in need, and their commitment to the work God has called them, has given Charles and Betty Alexander a notable life of service touching lives on two continents and beyond.